Just this morning you could watch Macron on TV telling us how he “saved” some 30 migrants from Libya by flying them straight out to Paris. There are at least a million more where they came from…. According to the letter, the cities of Lille, Bordeaux, Strasbourg, Grenoble, Rennes, Toulousa and Nantes are taking in “several thousand” refugees per month, which the mayors say is causing a social emergency as they are “backed up against a wall” and “completely saturated” by a seemingly endless flood of asylum seekers. The year 2017 ends with a massive rise in the demand for asylum and the arrival of newcomers puts extreme tension – particularly with the onset of the cold wave – of the classic public and institutional policies. In a proportion never before known, the mechanisms allocated to housing asylum seekers, led by the State, often with the support of our communities, are indeed completely saturated, despite the steady increase the number of places … The evidence is there, before our eyes, in our streets, in homes and shelters: there is urgency. In other words – Paris needs to step up and dedicate more money and housing towards the migrant crisis. 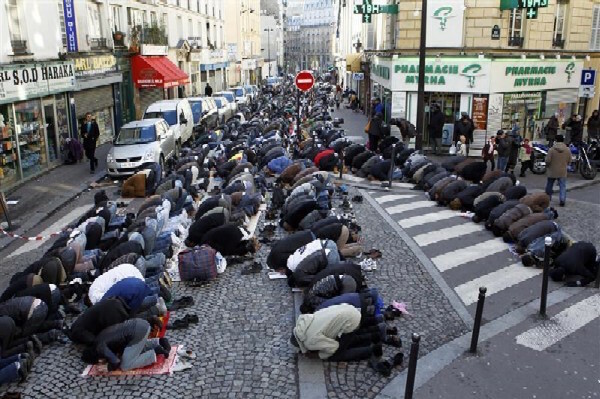 The invasion of France by Muslim barbarians has not been described by television, newspapers or the government as a threat to the country but as a rescue mission. Therefore, to turn a rescue mission into a deportation is to discriminate against innocent people seeking asylum. If the French have so blinded themselves that they mistake conquerors for asylum seekers, other countries are watching and waiting for the apocalyptic last chapters in the life of what was a unique and irreplaceable treasure of Western civilization. Israel is aware of what is happening, probably because so many French Jews have fled there with a tale to tell. The one failing among the Jews is that they do not see how critical the role of socialist, communist and “conservative” French Jews has been in the acceptance and even recruiting of Muslims to come to France. For how long have the Jews of France identified with the Muslim newcomers as fellow victims? For how long have the Jews of France condemned the non-Jewish French for being “racist”? For how long have they regarded criticism of Islam as the moral equivalent of antisemitism? For too long. Arutz Sheva (Israel National News). French president Emmanuel Macron has announced that the European Union and African Union will launch “concrete military and policing action” to rescue African migrants enslaved in Libya and arrest human traffickers. The development came as the EU pledged a Marshall Plan for Africa of €44 billion at a summit dominated by outrage over slave auctions in Libya of migrants sold “like goats”. Previous PostCzech Prez Miloš Zeman Calls Islam a ‘Culture of Hatred’Next PostMoslem gatecrashers stab & bash young Aussies for being Aussie….